U.S. 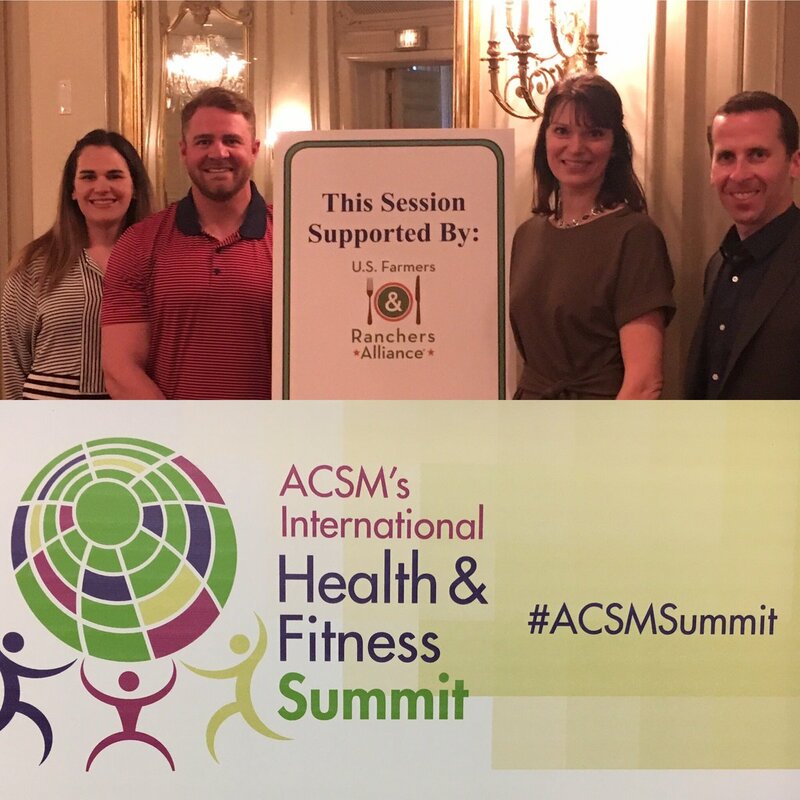 Farmers & Ranchers Alliance (@USFRA) invited me to participate in this panel along with a scientist (@MickeyRubin) and a farmer/bodybuilder (@SJSchneider10) at ACSM’s 2019 International Health and Fitness Summit (#ACSMSummit) in Chicago. These are some of the questions and topics we talked about. I was not asked to write this – it is not a sponsored blog, it’s sharing ideas coming out of our expert panel. QUESTION: We are currently in the Decade of Action on Nutrition (World Health Organization, WHO). What does this mean for us as Americans, especially when it comes to overall health and wellness? To me as a dietitian, every decade is the decade of nutrition! Officially and importantly, the WHO is focusing on all forms of malnutrition worldwide in this decade. We often think malnutrition means starvation, but it also includes obesity. We must have food to survive and thrive. Farmers have taken on the important job of feeding us/the world, literally and locally, everywhere they farm, which is everywhere we live. Every food starts on a farm and farmers support every eating style we choose to follow. Currently, people are moving farther from the farm so it makes sense why there are more questions literally from farm to table from people to learn more about food. The conversation is getting bigger. For food, nutrition, and agriculture, it’s a shared conversation. The questions are complex and involve the need for expertise from a variety of perspectives, which was the inspiration for our panel at this summit. The take away is that there is no one right way to eat to get nutrition we need. We all have a responsibility to learn about our food supply, and building our network of experts is critical in helping answer questions as well as address malnutrition globally and locally. The good news is, because of social media, video, and other important ways to connect, we can go directly to a farmer, a dietitian, a scientist, a chef – true experts in the areas we may have questions about. What is the most sustainable diet, and what does this really mean? Defining what we mean by “sustainable” is key in this conversation. To a person trying to lose excess weight, can it be kept off long term? To a farmer, can growing/raising food meet the demands of consumers and food companies, preserve/improve natural resources, and support a multi-generational family as a viable business? To a dietitian, can it support personal and planetary health? You see the point – it’s complex and yet there are simple ways to improve both the conversation and the outcome. An easy way to consider “everything” is to define this word in every conversation so everyone understands what aspect is being talked about and then look for the win-win-win. Is it viable for the planet, the people, and the plants/animals? Then we’re on to something good. When it comes to different types of growing methods, what is the impact on nutrition? This is more of a farming question than a nutrient question at this point, as research hasn’t found significant difference in growing styles of food when it comes to nutrition. The bottom line is, whatever food you choose to eat, a farmer has you covered. There are farmers local to all the places we choose to live, and food is grown where it makes sense to do so. Illinois is not a good place to grow bananas, as an example. Regardless of what food you buy and eat, remember to wash your hands before, during and after food preparation, separate raw foods from cooked, store food properly, and wash your fruits and veggies before eating them. Read more about the National Organic Program here. Read more about pesticide regulatory information from the EPA here. A big thank you to all who chose to come to our session Friday and/or Saturday. Food and nutrition has amazing complexities that are fun and important to understand. What curiosity about food and farming do you have? Drop me a line if you want to talk more, and don’t forget to follow experts from farm to table – and beyond. Foods, flavors, and recipes your state/territory is known for, and how they fit into your healthy eating style.